Recently I wrote about all the things I was able to make and preserve using the apples my aunt shared with me from her very prolific backyard apple tree. I of course made and canned apple pie filling but also applesauce, both plain and cinnamon/vanilla flavored and dehydrated crispy cinnamon/sugar apple slices. But now it’s time to put that apple pie filling to the test – let’s see what kind of convenience food I’ve been able to provide for the supper table. I had just fed RancherMan a pretty simple meal of homemade chicken & dumplings, and although it was delicious, it was still a pretty basic meal. Usually when I serve a meager meal I like to include a delicious homemade dessert to add a little POP! So I eyed a quart jar of those home-canned apples and decided I would make him an apple pie. Since the apples have already been processed, this is gonna be super EASY (and quick). Homemade Apple Pie In A FLASH! First I whipped up my recipe for a Double 9″ Flaky Pie Crust. I rolled out half and lined the bottom and sides of my grandmother’s vintage pie plate with the bottom crust. Then I opened a quart of that home-canned apple pie filling and poured it in. With the remaining dough I rolled out and quickly cut it into strips using a small pizza cutter. I’ll use these strips to make a lattice top for my pie. Now while cutting the crust for the lattice top was quick, it still involved weaving strips to form the lattice. I’m not sure that the lattice top was worth the effort it took nor the difficulty it contributed to a nice neat cut of my baked pie. Next time I’ll probably just roll out two sheets, one for the bottom & sides of the pie and a top sheet to go over the filling – I’ll just cut a couple of slits to let the steam escape and I’ll be done. But this time I used those strips of dough to weave a lattice design on top. Now all that’s left is to put my apple pie into my oven heated to 375 degrees. I baked my pie for 35 minutes and it baked up perfectly. I cut it into thick hearty slices and topped them with a little dollop of whipped topping. (OK a smidge larger than a dollop for RancherMan’s serving!) I felt like June Cleaver as I served this homemade treat hot from the oven. So there ya have it – easy homemade apple pie from scratch in minutes! Now THAT’S my kind of convenience food. 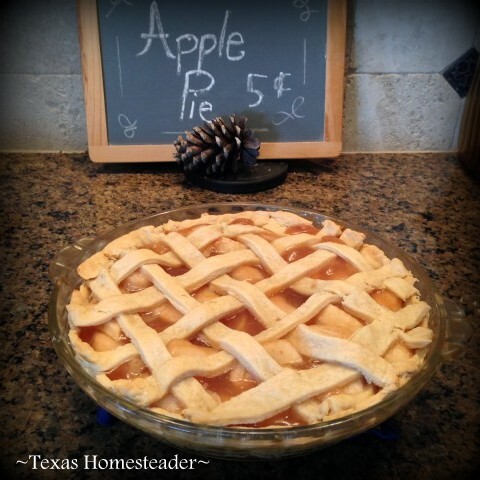 This entry was posted in Blog Posts and tagged Cooking, Fall, Make-It-Yourself, Recipes on October 4, 2015 by Texas Homesteader. This looks great. I did up some canned apples last year hoping to make a pie with them, but sadly they lost their seal and had to be tossed. Perhaps I will give it a try again this year. Oh my gosh that looks incredible!! Thank you so much for sharing with us at our To Grandma’s house we go link party! Pinned! I am very impressed by that yummy looking pie. And, a home-made crust. Ambitious girl! Ever since I discovered how easy it is to make homemade crust Latane, I’ve never turned back. (blushes) thanks Sarah. It was devoured by RancherMan with much enthusiasm!